← Just how contemptuously bad can cycling infrastructure get? A fairly self-explanatory post, this one. Bus lanes are not cycling ndeednfrastructure. There are lots of reasons why they shouldn’t be, which we’ll come to, but it might be worthwhile looking first at how we’ve ended up thinking that they are cycling infrastructure. 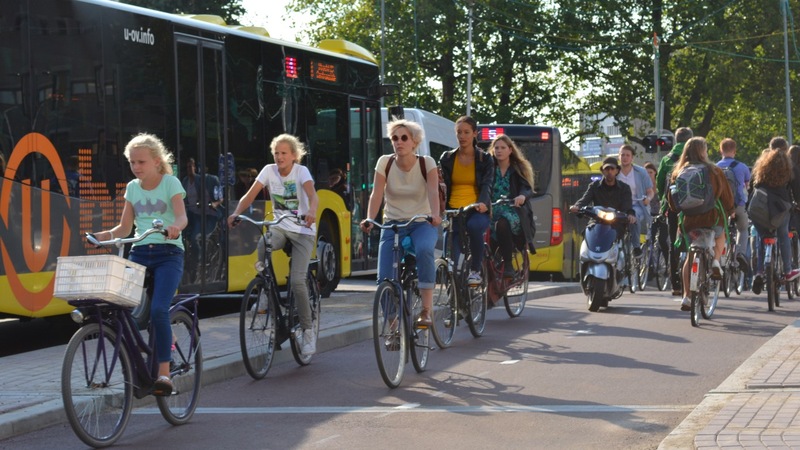 Better than cycling in general traffic lanes – rather than having to deal with buses, taxis and general traffic, you ‘only’ have to deal with buses and taxis. This is the guidance for providing for bicycles and it can not even imagine a world in which bicycles might have priority over turning vehicles… The authors of LTN 2/08 can’t imagine that world — can’t imagine that there could be any alternative to our might makes right of way world. Bus lanes are only ‘an important part of cycle networks’ if you have very low horizons; that you can’t imagine any kind of ‘provision’ for cycling beyond a choice between crap off-road provision, general traffic lanes, and bus lanes. It turns out – if you read the Reid and Guthrie report quoted in the passage in LTN 2/08 – that bus lanes are only ‘popular with cyclists’ because they’re less crap than the alternative of… ‘no bus lanes’. This is a very weak basis for claiming that bus lanes are actually ‘popular’ – by analogy, it would be like suggesting swimming across a fast-flowing river is ‘popular’, because it’s less unpleasant than swimming across a fast-flowing river with crocodiles in it. On the negative side, bus drivers and cyclists appeared to have a generally low opinion of each other and it is recommended that efforts be made to address their mutual concerns. This may be achieved by reducing the opportunity for conflict, which appeared to be directly related to the narrowness of the bus lane, and by educating both classes of users as to each others’ needs. Cycling in bus lanes creates antagonism, which is unsurprising given the different needs and requirements of these two modes of transport. Note that the only solutions proposed for reducing this antagonism are education, and widening the bus lane. Buses are not usually as fast as other motorised traffic, although at times, they exceed what cyclists might consider to be a desirable speed. Again, this is the ‘desirable speed’ in the opinion of cyclists, not the general public. A bus travelling at 20-30mph isn’t at all ‘desirable’ for the people who aren’t already willing to cycle with motor traffic. cyclists feel more threatened by buses than they do by cars, probably because of their greater size… The acceptable passing distance for overtaking buses on the highway is, therefore, likely to be larger than the acceptable distance of overtaking cars. The report considers that an in-lane overtake by a bus, within a 4.2m wide bus lane, ‘might be considered safe by 100%’ of cyclists, based on 1970s research about acceptable passing distances. Again, digging out that research reveals that this is based on a sample of just 25 cyclists, ‘most representative of the national cycling population’ – i.e. drawn from people already cycling on the roads in 1978, who were likely to have a much lower threshold of ‘acceptability’ in overtaking compared to people not cycling. Acceptable for ‘cyclists’? Or for anyone else? So the research and recommendations examined here are based around the preferences and value judgements of existing cyclists – not of the people who aren’t cycling at all, but might like to – and also framed around the relative benefits of cycling in bus lanes compared to general traffic lanes, not compared to the benefits of cycling in dedicated cycleways, separated from both buses and general traffic. 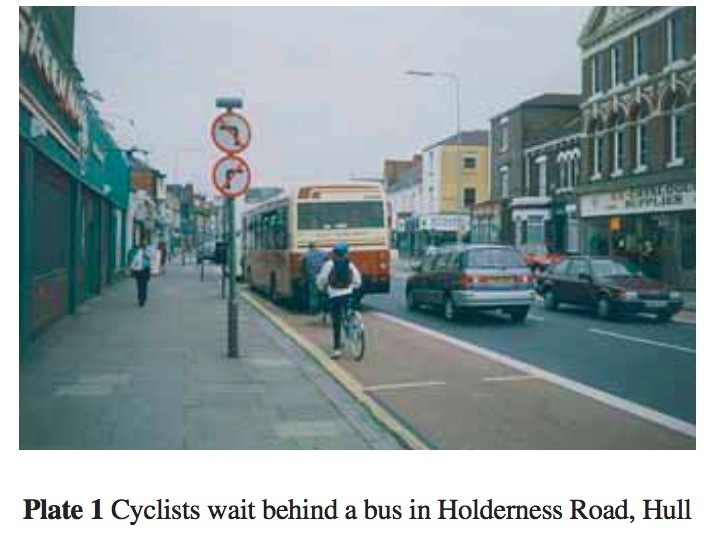 The report also reveals some fairly obvious problems with bus lanes – namely, bus stops. From page 11 of the TRL report. Most negative comments focused on problems at the bus stops, e.g. ‘bus stops in cycle lanes are dangerous for cyclists’, ‘They’re fine except for buses pulling into stops’ and ‘Dodgy at bus stops’. Other negative comments included, ‘They’re very unsafe as buses are inconsiderate and don’t heed cyclists’, ‘They are dangerous – a contest between cyclist and bus driver’. And to be fair, the report does take this feedback on board, but only by suggesting bus lanes should be wide, and that advisory cycle lanes ‘should’ be provided inside 4m+ bus lanes, and that ‘more research is necessary into the optimum methods of resolving conflicts and delay to cyclists at bus stops’. Overall, this is a very weak basis for trumpeting the benefits of bus lanes for cycling, and indeed for suggesting that they are an ‘important part of cycle route networks’, as LTN 2/08 goes on to do. This claim is only really justified on the basis of the alternatives being even more dismal; the research used actually shows that buses and cycling sharing the same space does not work well, at all, for either party. This isn’t just about cycling; if we’re interested in greatly increasing cycling levels, and broadening the cycle demographic beyond the existing ‘traffic tolerant’ group, then that’s going to create serious problems for bus journeys. Putting young children and the elderly in bus lanes just means that buses will be trundling at very slow speeds. Of course, even if we do theoretically manage to achieve this level of cycling in bus lanes, more generally putting large numbers of people cycling in them just won’t work. Buses would be swamped with people cycling swarming around them; journeys by bus would be painfully slow. 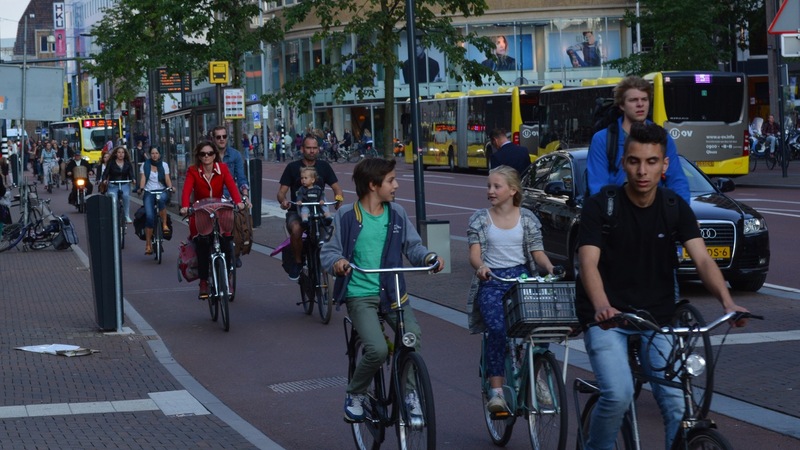 This is one of the main reasons cycling is not accommodated in bus lanes in the Netherlands. Buses are treated almost as more of a light rail mode of transport, with stops less close together, along high speed direct bus corridors, free from things that might slow the buses down. And of course the other substantive reason why cycling is separated from bus lanes is safety. Buses are large, heavy objects that travel faster than people cycling, and have the potential to seriously injure, or kill. Sustainable Safety demands that these two modes of transport should be separated as much as is possible. With all this in mind, it’s pretty disappointing that the message doesn’t seem to be coming across clearly and simply in UK cycle campaigning. Hearteningly, the London Cycling Campaign has adopted policy – described here by Rachel Aldred – making it fairly explicit that bus lanes are not cycling infrastructure. Bus lanes are not ‘protected space’ so, regardless of their presence, we use our normal assessment of when protected space is needed. This threshold is over 20mph speeds or over 2000 Passenger Car Units, PCUs – for total two-way motor traffic flow, in all lanes. According to TfL a standard (non-bendy) bus is 2 Passenger Car Units. … Too often decision-makers assume zero-sum trade-offs between sustainable modes. But separating buses and cycles at network or street level may provide benefits for both, such as time benefits. We believe decision-makers should consider wider benefits of providing well for cycling, such as better public realm, improved health, and increased mode choice. And some of this clarity has started to filter through to road designs in London. The higher standard Superhighways now being in the capital do not (for the most part) lump cycling in with buses, but provide protected space for cycling, separated from general motor traffic and from bus flows. But it seems that there is some unfortunate inertia in other areas of cycle campaigning. Sustrans’ recent Bike Life survey had this unhelpful graph included within it. 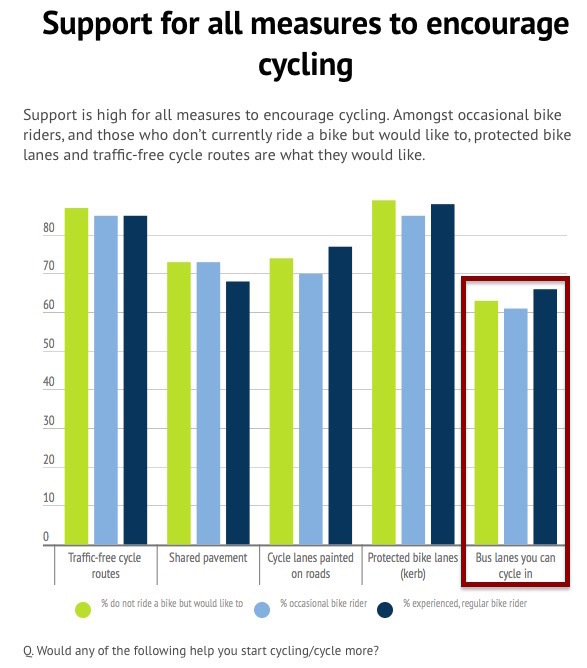 Not only are ‘bus lanes’ (along with shared pavements) described as ‘measures to encourage cycling’, but it is possible to draw the mistaken implication from this graph that 61% of people who do not ride bikes (but would like to) would be happy or willing to cycle in bus lanes. This isn’t the case; 61% of this group have merely said that bus lanes might help them start cycling, which is quite a vague statement. 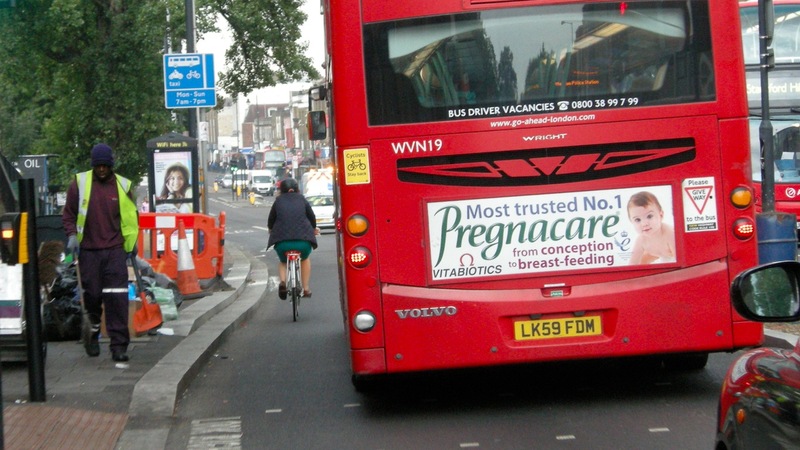 Bus lanes might be okay for ‘cyclists’ – they’re marginally better than the alternative of cycling in general traffic lanes, and I must admit I do feel a slight easing of tension once one appears, knowing that I have slightly less to deal with. But they’re not acceptable if we’re designing for all ages and abilities. Nor is putting cycling and buses in the same space acceptable for bus passengers, in the long term. There needs to be clarity that these are two very different kinds of transport, and that while fudging them together might be acceptable in the absence of any other alternatives, bus lanes are most definitely not cycling infrastructure, nor should they form any part of a serious modern cycle network. Yes; it would be good to have each essential road with footway, cycle track, bus lane, general purpose lane in both directions but there are many situations in the older suburbs where there just isn’t space between the buildings even if you eliminate on-street-parking/deliveries. Taking the cars on a by-pass in outer London would involve knocking down a lot of houses. As you admit Bus Lanes are a lot better than nothing (better than 1.5m cycle lanes IMO). But when ‘there isn’t enough space’ they conclude that there’s not enough space for safe cycling, never that there is not enough space for private motor cars, the least space-efficient transport we have. If space is your limiting resource, pushing people into greater use of cars for want of safe alternatives is not a response to the problem. Bus lanes exist because of widespread use of private cars congesting the space that used to be used by buses, not because there is a fundamental mismatch between cars and buses sharing space. In fact, bus lanes aren’t really necessary for most hours of the day when there is no congestion, whereas cycle lanes are needed all the time to separate slower, more vulnerable users from several tonnes of faster metal. But mostly, it’s just the dishonesty of it. Fine, there’s not enough room for cycle lanes as well as all the other things they’ve decided are more important. But they shouldn’t pretend they’re doing something to encourage cycling, or providing cycling facilities. They are not. 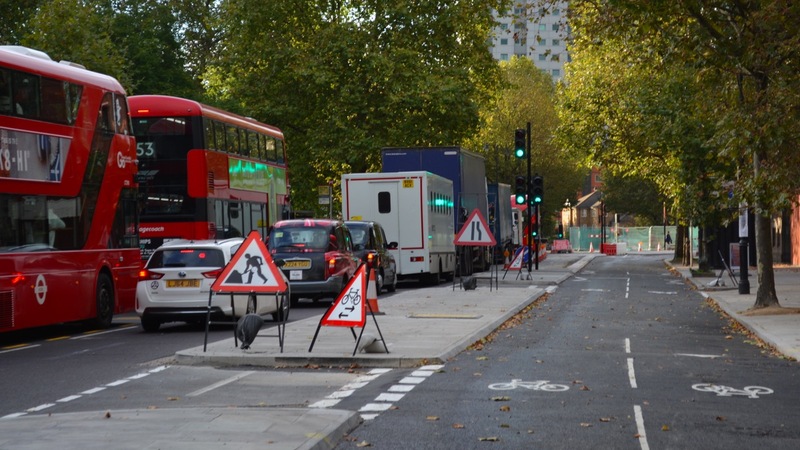 I am afraid that I must take issue with your statement that bus lanes don’t encourage cycling when the survey quoted in the blog indicates that most cyclists think they do. That is not to say we shouldn’t push for a better solution where possible. The distances in Cambridge may make commuting by bike accessible to everyone – in London public transport, and hence bus lanes, is close to essential. And yet bus lanes have been a common feature of many UK cities for years, while cycling languishes at 2% modal share. I can only conclude that that there are problems with these findings, which, let’s be clear, put bus lanes as the least favoured intervention mentioned. In the context of being asked in a survey about cycling people are under social and moral pressure to say of course they’d cycle if only conditions were different, because they have to rationalise why they don’t do something which they know to be beneficial in a number of ways. Actual behaviour does not bear this out. Size of city isn’t a good indication of average journey length. The closest schools and shops and GPs are generally no further away in a large city with multiple hubs, than a small city with one central area. Large cities also tend to be more dense. Not to mention that many of the cycle commuters in Cambridge don’t live in Cambridge: as a small city there are many more jobs here that there are houses to fit employees, so people are travelling greater distances from suburban and rural areas. There’s more cycling in South Cambs than in most UK cities. Distance is not necessarily the deciding factor in whether people do or do not cycle. I haven’t said that buses aren’t necessary. I said that what is stopping buses running smoothly is the much less space-efficient but popular private vehicles using the roads. As alluded to in the article, forcing buses to share space with slower moving bikes at times when the roads are not congested is not doing essential bus journeys a service. When the roads are not congested buses can, and usually do, overtake bicycles by moving out of the bus lane. It is would be ideal to keep cars out of the middle of a town but that is not practicable for a suburb with no by-pass or room to create one. What to do with the space between the buildings is a political choice. In my borough we don’t have either bus lanes or cycle tracks. It’s only cars that count. I was quite surprised how much I took bus lanes for granted and the amount of extra safety room they provide however that safety gap soon disappears when you’re using a timed bus lane outside of it’s operational hours. Many years ago I had some idiot who was using the lane before Brixton High Street to undertake traffic (at quite a speed) as I was using it and since then often find that on the rare occasions I’m riding outside the general rush hour periods I’ll have some moron come barreling past. As you say the problem stems from cyclists and buses being fundamentally different modes of transport, as a relatively light and slow cyclist I want to maintain momentum as much as possible which is the polar opposite of a heavy and fast bus which MUST stop often, again I’ve lost count of the amount of times, in bus and general traffic lanes, I’ve had a bus overtake me WITH THE INDICATOR ON to pull over at a stop…..
IANABD but I read that London buses have onboard software which tells the bus driver to be at each stop at a certain time. Too fast or too slow means TfL penalise the bus company and the bus company use it as a KPI for the drivers. If the driver is running behind schedule that couple of seconds ‘saved’ by overtaking you just to stop, may actually make a difference to them. Just another TfL policy that makes it less desirable to cycle in London. All good stuff Mark, but I mused the other day as I got on my bike in a London bus lane – were they a necessary first step to achieving the growth in cycling that we’ve seen over the last 15 years? 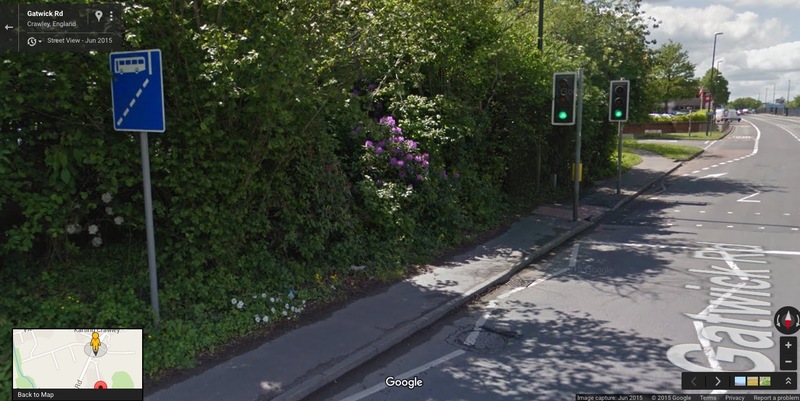 Last night at a residents’ meeting I was told “there’s no need for cycle lanes here – they’re only 1% of the traffic”. I know all the arguments but politically it’s a hard one to get around. I think one of the greatest by-products of the London bus priority measures of the 80s and 90s is that they enabled *some* growth in cycling to occur which began to create the critical demand for better provision. Just think how bad some streets would be without them and ask yourself whether we would see anything like the amount of cycling there is today if they weren’t there. I take bus lanes as a good approach to immediately give a lot of mileage of more easily cycleable street, but bike/bus shared lanes should be replaced over time with real bike facilities. Paris made a great short term move for the cycling network by encouraging cycling in bus lanes, but many years later they’ve seemingly made little effort to create separate facilities. Very sad. And the same has happened in London. Claiming bus lanes are infrastructure does not help. Paris is generally not a good example to follow. No, in fact it’s a very good example to follow, in what it shows a perfect counterexample of what doesn’t work for cycling (they’re rather good at implementing the sort of stuff generally favoured by “vehicular cyclists”, and yet they’re stuck at <3% modal share for cycling, low even by French standards). I'm afraid none of that had had any significant impact on cycling. The city government includes bus lanes open to cyclists in their tally of "cycling infrastructure", which encouraged them to open many of them for a cheap increase. Lately, two-way cycling on one-way streets has been used as an even cheaper measure to increase the counter (just update some signs). Some are very welcome, some are purely insane in the absence of specific infrastructure (far too much traffic on far too narrow streets, e.g. https://goo.gl/maps/HovG4u4tGEE2 although the image doesn't show how busy this street is). I think rebalancing this space-use has to be both our immediate and long-term goal. We need to push and pull people out of cars in to other means of transport, which are safer, less polluting, less greedy of space and resources, less isolating, for many reasons. Until that is done and to those ends, bus lanes are a good tool to start reblancing our roads; they allow buses (and often other vehicles which are not private cars, such as taxis and motorcycles, as well as bicycles of course) to be relatively faster than cars at the times it matters most. More importantly, they allow this to be seen by the car users stuck in their jam as the bus drives past. 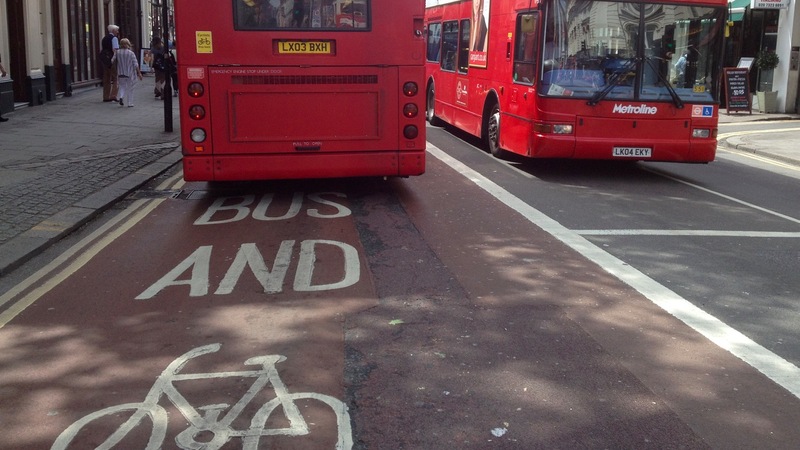 No, bus lanes are certainly not ideal cycle lanes. But they are better than general lanes. I must say that the 4.2m bus lane would be the absolute worst width possible. Buses are 2.5m, so there would be at most 1.7m of space left. Where you do cycle? Go near the edge and a bus driver might not bother pulling out, cycle further out and you get less overtaking space. At least the 3m bus lane ‘forces’ bus drivers to change lanes if you cycle near the middle. OTOH 1.7m would be quite a decent cycle lane and traffic tends to drive to the edge of that. Certainly your argument holds for anything between 3m and 4.2m. Sorry to reply to an old comment … but 4.2 m bus lanes are actually quite helpful in overtaking stationery buses, particularly when the stop is just in front of traffic lights and thus the traffic lane to the immediate right is often blocked. A 3 m lane means that you are stranded behind the stopped bus, whereas a 4.2 m lane gives you space* to filter. 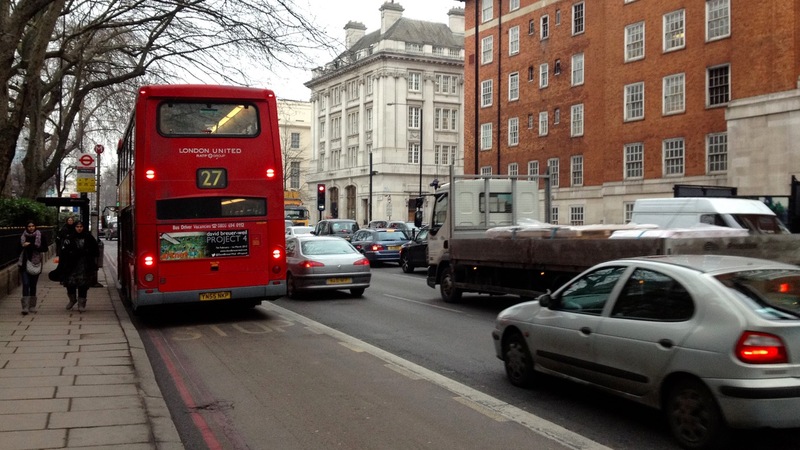 Narrow bus lanes also increase the risk of buses (and thus the cyclists stuck behind them) getting trapped behind big and/or incompetently positioned stationery vehicles in the traffic lane – happens all the time going south down Brixton Hill in the morning. (compare this with this in terms of ease of filtering). Good stuff as ever. I have to cycle in the Crawley bus lane at the top of your picture as there is no other alternative to cycling on the road along that stretch. It’s not ideal but until WSCC provide us with some decent segregated lanes it’s safer than the alternative! Many bus lanes are uni-directional – only running on one side of the road – and this can decrease the amount of space for cycling in the opposite direction. The worst part of my commute is the section of the A310 between Twickenham and Kingston, coming out of Twickenhame town centre – known as Cross Deep. It has a bus lane going into the town centre, but coming out of the town centre the general traffic lane is quite narrow, and there is nearly always traffic queuing in the opposite direction limiting space for overtaking. The council has painted a narrow cycle lane on this side. The reason there is so little space outbound from the town centre is because of the bus lane taking up so much space the other side. For me, this has always been the most scary part of my route. For much of the last 4 years, I’ve put my bike on the train between Twickenham and Kingston to avoid it (without this alternative for when its wet, dark, or I just don’t feel up to having my nerves shredded, I would have bought a car several years ago and dispensed with bike/train); sometimes attempted to sprint along Cross Deep in the middle of the traffic lane, avoiding the bike lane entirely (causes occasional hassle from drivers, and leaves me breathless), until I pass the roundabout where the bus lane disappears and the traffic lanes and cycle lanes become wider and allow safer overtaking; sometimes stopped to wait after the lights before entering Cross Deep, to time it such that I am at the tail end of a stream of cars, rather than in front of them; sometimes cycled along the pavement; sometimes got off and walked. For a number of months I gave up on cycling entirely and used bus and train – I may do so again this Winter, as in the dark this section of my journey is more scary than in Summer (cars seem to pass closer, though probably my perception is altered by the dark and heightened fear). The cycle lane itself is poor – barely much more than 1 metre wide, and sometimes less than half of that is usable as whoever put down the red surfacing did it between and either side of the yellow lines, rather than resurfacing the full width of the cycle lane and repainting the lines – the result is nasty grooves that catch your tyre… it also has a number of defects such as poorly sited access covers, which either necessitate maneuvring out of the narrow cycle lane into the busy and narrow general traffic lane (tricky), or holding on tight – I try hard to avoid the latter option, as the jolt has caused bits to fly off my bike on two occasions (a bikelock and a light), though it’s not so bad if I slow right down. I’m probably not the only person to have this sort of problem as a result of a uni-directional bus lane – for me at least, they’re a double-edged sword: my journey into Twickenham is better because of the bus lane (relative to the rest of the A310, with its wider traffic and bike lanes; fortunately only 2 bus services use the bus lane I think, so it’s never busy), but worse than the rest of the A310 going in the opposite direction coming out of Twickenham. Overall, I believe the bus lane makes my journey a more challenging and frightening proposition than if there was no bus lane on the way into Twickenham at all and just two wider traffic and cycle lanes as per much of the rest of the A310 between Kingston and Twickenham. The quality of that cycle lane is inexcusable. The fact that it is merely advisory and parking is allowed by Radnor Gardens at weekends also makes life difficult for cyclists. The bus lane is , as you say, of double edged benefit for cyclists but is undoubted benefit to a probably greater number of bus passengers so is probably positive in terms of public interest. Another excellent blog post as usual! Something which I would be interested to know about is the extent to which bus routes are “unraveled” from car routes in the Netherlands. I remember seeing in one of Mark Wagenbuur’s videos that there were two separate single carriageways beside each other, one of which was for cars and the other for buses. This is not something I have seen in the UK – I suppose we would have a dual carriageway with two lanes in each direction, and the inside lane might be a part-time bus lane. It strikes me that painted on-road bus lanes suffer from some of the same problems as cycle lanes, namely that they can be parked in or driven in, and are often discontinuous at junctions. An “unraveled” route, or a greater level of segregation, is preferable in both cases I think. 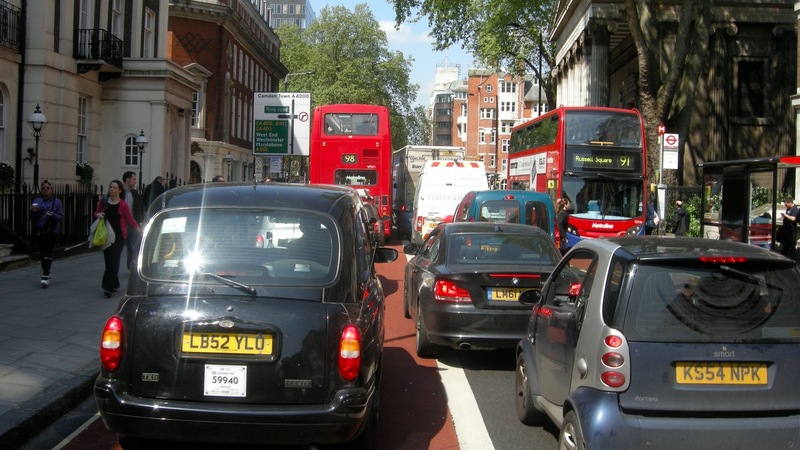 One important factor that makes London’s Bus Lanes especially dangerous for cyclists is that, according to TfL Bus Drivers (see “Driving Blind: Guest Blog by Bus Driver V” http://saferoxfordstreet.blogspot.co.uk/2015/02/guest-blog-by-bus-driver-v-driving-blind.html), the design of the Bus Driver’s cab and nearside mirrors essentially means that Bus Drivers are “Driving Blind” precisely on the side of the Bus where the Cycling Lanes are located. There are better bus mirror designs (see http://saferoxfordstreet.blogspot.co.uk/2015/02/guest-blog-by-bus-driver-v-driving-blind.html) that would go far to mitigate the current design flaws, but TfL does not regard the safety issues raised by this design flaw as important (cf. Mayor’s Question Time Response to Val Shawcross May 2015 http://questions.london.gov.uk/QuestionSearch/searchclient/questions/question_281569). Generally there isn’t a Cycling Lane on the inside of a Bus Lane so this isn’t so relevant to the current topic. Perhaps an argument against wide bus lanes – if the adjacent general purpose lane is clear the Bus can move right out to overtake, if not it will have to wait.